We often get so wrapped up in the minutia of the lessons which are taught in the Scottish Rite Degrees that it is easy to overlook the over-riding themes which are presented in the Rite. Almost every Mason knows that the Degrees of Freemasonry represent the journey of a man’s life. For example, it is often said that the Entered Apprentice Degree represents the journey of youth; the passage a young man takes as he begins to consciously weigh the differences between right and wrong, ignorance and knowledge, good and evil, and starts to mold the character he will fashion for himself, using the influences of his life as his guide. He has, in a real sense, been initiated by the circumstances of his life; for good or bad. Freemasonry provides him a stable image for life building, and admonishes him to start over if his first attempt didn’t go so well. Likewise, we think of the passage of the Fellowcraft as one where the initiate takes stock of his progress in life; a kind of a review of what he knows, and doesn’t know, what has worked for him, and what still remains to be done. He makes an accounting of what he has learned from his experience, his upbringing, friends and acquaintances, education, culture, and community. If he is like most men, he reaches a point where he has studied just about everything in his life but himself. He becomes consciously aware that life is not just about outward appearances, tasks, money, and relationships. He feels a hunger for additional meaning. Masonry informs him that, to feel complete, he ultimately has to affirm himself. This requires a different kind of journey all together. In Masonry, we think of this more intimate and deeply engaging step in the journey to manhood an important awakening for each man. In ritual terms, it is called “passing the outer door of the temple.” As one of the oldest institutions serving men today, we also know this is a stage of the journey that four-fifths of the male population in the world will never choose to take. Yet the consequences of not knowing oneself are staggering. One of the goals of Freemasonry is to help men take this most significant step forward with their own life. The journey to mature masculinity doesn’t stop for the rest of us just because some guys choose to exit the train. For the man who sincerely sees Freemasonry as a transformative art, everything it suggests to, and instructs him from that point in his life where he consciously decides to work on himself, has to do with his awakening consciousness. 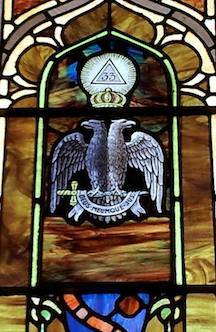 The Scottish Rite knows this aspect of a man’s journey well, as it is itself the product of the great movements in history which were all tied to the structure of consciousness. The point of awakening consciousness is precisely where the Scottish Rite joins each man’s journey. The experience of the aspirant through the degrees of the Rite is supposed to be his journey to a higher awareness. It is designed to carry him to a higher level of insight. It is a progressive system of awakening consciousness. Its power lies in its ability to integrate its lessons into the psyche of each individual, meeting him on the level of his own experience, and giving him an opportunity to be transformed by the path of his own life. For men, life needs to be seen as a journey. Freemasonry is built on the clear understanding that men need to be engaged in their own quest for self-improvement. The Scottish Rite facilitates this fundamental psychological need in men. A brother becomes an Elu in the first degree of Masonry when he receives the Apprentice’s prayer. Hands are laid upon his head and he is anointed as one of the “elected” or “elite” entering the Brotherhood of Man. He has been selected by his peers because they see his potential to rise among the best to become the small elite of enlightened minds. But even though he is chosen, he may not become enlightened. God has made men with different intellectual and spiritual motivations and capacities. The Elu Principle avows that, from the ranks of men who desire to improve themselves in Masonry, some will take on the pursuits and occupations of the initiate’s life. These will become the Perfect Elus, the continuators of Creation who will receive the highest levels of knowledge and insight. These will become the gifted and enlightened men. One of the great mysteries of life is that no man can know the principle of his own life. No single element of life has an intrinsic, essential reality of its own. The power and action of will, movement, of thought, memory and dreams are all mysteries. Yet we have a natural impulse to seek the unknown, to seek God in the mystery of our own being. The Royal Arch Tradition maintains that a man must gain access to the knowledge of the Divine truth only by seeking ever deeper within his inmost self, his soul. In Masonry, the crypt or vault is an inward symbol reminding us that it is the internal and not the external qualifications that make a Mason. A man’s soul is his spiritual dimension of the universe, the inmost part of his being where alone he may feel and realize the nature of God and find peace within himself. . Among the easiest of emblems to interpret, the rose and cross is one of the great combination symbols of Freemasonry, second perhaps only to the square and compasses. To the Christian Mason, the cross refers to Jesus Christ. But in a broader sense, it symbolizes self-sacrifice for the sake and redemption of mankind. The rose, being among the most beautiful of flowers, symbolizes perfection, and represents hope in a new awakening, renewal, a resurrection of life. The two together (Rose Croix) symbolize faith and hope in immortality won through sorrow and sacrifice. The Rose Croix Tradition informs us that the world is what it is, and we should focus on how to deal with it so that good and the law of love may prevail. This requires a constant fight within our self, and in society. Faith in God and mankind is Wisdom; hope in the victory of good over evil gives Strength, and charity towards all living creatures through respect of life, tolerance and selflessness is Beauty. The Ancient Mysteries tradition is one of those timeless checks and balances which remind us that our concept of Deity must be felt within because it cannot be wholly conceived intellectually. A society’s concept of God and the universe changes over time with its scientific development. The objective of the Mysteries was to cause a change in the initiate’s condition of mind wherein he could feel the common core, or universal truth, in all religious traditions. The methodology Masonry employs to treat topics that cannot be known or explained is to mystically inspire a feeling about these higher principles through the use and expression of symbolic images, emblems, and hieroglyphs. This was the way of the Mysteries. Rather than a prescribed routine of creed, the Mysteries invited their initiates to seek, feel, compare and judge in order to awaken the mind and develop its creativity. The Ancient Mysteries Tradition affirms that the gap often created by the insufficiency of popular religions and dogmas can be filled by reason and virtue. Every man needs to possess at least some knightly energy. Being a knight is one of the essential archetypes of manhood. Freemasonry draws on the Knighthood tradition which dates back to the Crusades. Knights were expected to be the most gallant and virtuous of men. Such men dedicated themselves to the defense of right in the world. Their basic ideals were family unity, moral education, courage, honor and courtesy. A Mason is first and foremost a moralist, a philosopher, a symbolist and spiritualist; but he is also a soldier of honor, loyalty, duty and truth; actively engaged in the warfare of life. The Knighthood Tradition declares that the fight for the very best virtues against ignorance, tyranny and fanaticism is a constant engagement. Life is a battle for good and to fight that battle heroically and well is the great purpose of man’s existence. We all progress upward toward perfection through the same life struggle. Our goal is to live up to the promise of the Elus. This is the essence of true Masonic Knighthood. There is no essential secret in Freemasonry since it is, above all, an aptitude and a state of mind. It is a virtual secret to the uninitiated much like literacy is to an illiterate. Secrecy in Masonry is synonymous with mystery. A mystery is a reality which has not yet been fully understood. The major goal of our lives, as Masters of the Royal Secret, is to unravel the mysteries of our own life. The Secret Tradition represents the quest for equilibrium in the universe, the harmony and unity of the whole, and its application to our personal lives. This is the ultimate quest of mankind, and teaches us above all else to reverence ourselves as divine immortal souls and to respect others as such, since we all share the same divine nature, intelligence and ordeals. This requires LOVE, which is the true word of a Master Mason, the Royal Secret and Holy Doctrine of the every true brotherhood.